As you are peruvian and you know your Cristal.. Which template should i use for the away kit? In this world there is something called falsification. I dont know why cant you understand that: THIS SHIRT IS A FAKE. ADIDAS NEVER SELL IT. Thanks God I have never bought anything on Mercadolibre... i will try to update cristal away so. 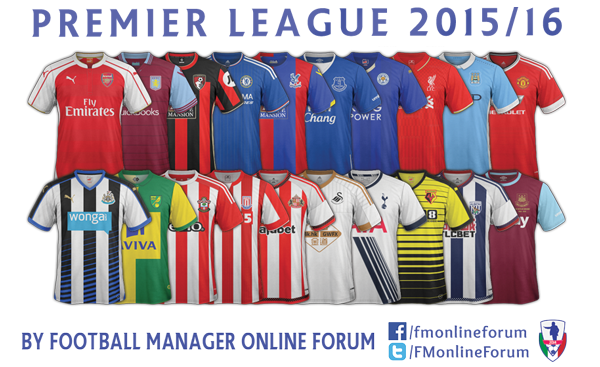 Just like to post these on here for whoever doing packs in the English football leagues these are 100% correct kits checks we're done via the club sites and wikipedia.. By the way I'll look into more clubs in the league shortly as its taking around 2 hours each league to cross reference due to poor picture quality on some clubs shop / stores .. I'll happily make a pack for the Midland Football League Premier Division (9th tier of England). I've made a few of the kits already but it may take a while to complete all of them as only a couple of clubs have photographers attending matches. Hopefully I can get them all done before FM 16 releases though. I would have looked at more kits in the leagues but isn't easy to do right now ..? Because a lot of home kits have been used plus people need to be careful as some teams are using two brands for home and away kits due to budgets compared to teams higher up league plus some cubs don't have club shops so it makes it a lot harder to find kits but if your lucky will find them on Facebook.. I hadn't thought of facebook, I'll have a look on there soon. I know some clubs have only worn one kit so far this season as despite them being home and away kits they seem to use the home kit as long as there isn't a kit clash and the away kit is only a last resort. Any news about Championship 15/16 pack? Mate I think is on pregress along with all the other english league. i would start with Albania superliga and first division .... it's ok? Nice work mayday, I was waiting for this pack. Thanks! Is one of my favorite league too. Mate, If you point a third time, nothing will change anyway. I know you are a perfectionist, but unfortunately "making SS Kits for FM" cover a small part of time in my life and I cannot spend ages on them. I am working 10/12 hrs a day as manager (bit stressfull), I go to gym, I have a girlfriend living with me (so i cant make a kit while she is home with me ;-), friends, swimmingpool or football match once a week....so I dont have much time and I try to get as much as I can from the spare moments I have. I know your FB Kits are perfect, very similar to reality and I much apprecited that you have downloaded mine giving me feedback , but as I sad, with the time i have, Im trying to do the best i can. As seems you like FB , shouldn't affect you too much if an SS pack is not 100% correct. Anyway , If you would like to remade the Thai pack, you can do it. @@hammer9 or any other "Boss"
If the quality of my works is too poor for the standard of the forum, please tell me and I will stop. As I said, I am trying to do my best with the time I have. Feel free to contact me for any problem. With all the message above, I am not saying I am upset...simply I am explaining how is my situation and If you are happy I can go ahead...otherwise I can stop. anyway...i said what i said, expecting a feedback from you, like "ok, what i have to change" or "what is missing"...after that i could help you out, but, after reading what you have wrote, well, i only have to answer with a...laught. pointing all that you have pointed it makes no sence, since we all have private lives aswell...we don't live from this, so i don't understand why you have to point all those private things that you do or don't do. of course people is happy to see packs, packs and more packs...so i say, keep them coming...there's no need to be a cry baby just because someone pointed that you can do better. take it has a constructive critic. Yes i am very sensitive and romantic, thats why ladies like italian men. I was not crying at all, I was trying to stop your frustration agaist my "ashamed"Thai Pack. Twice the thai pack has been mentioned and twice you came with your comment. I understood you were pointing something...you dont have to repeat it again and again...I am simply not interested to reply to you. I have just infomed you that repeating is a shame will not chance anything. I pointed how is my life and the way works with packs because in future with new packs you don't have to became crazy again to get my attention on your comment. If you are happy With my job you can download the packs otherwise dont. I'm sure you have a private life as well and i'm impressed to see a 40 yrs old man leading the FB kits team and working so well. (I am actually interested to ask you a friends request on facebook to know better each other ). A part this, i think all is done. Nothing more to add. Its clear you dont like my pack , it s clear i dont listen your feedback.